I landed in Toronto in late January. I dragged four suitcases, the maximum number I could afford to bring. It had been a scramble to make sure I came under the weight limit. 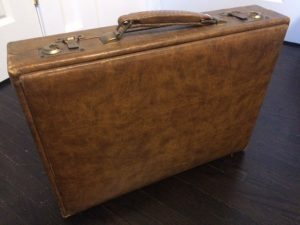 I was “importing” a healthy stack of books and a battered tan leather briefcase full of magic tricks. Hustling through the tangle of chrome and glass that is Pearson was exciting and intimidating. I’d picked this flight because it fell in the post-holiday travel period, and was cheap. The ghostly emptiness of the terminal was unsettling. I lost my way once but eventually made it to immigration. In prepping for the trip I’d committed my Toronto address to heart, and although I had yet to book my return flight I’d figured out a rough estimate for my stay. “Oh, well I have some saved,” I answered timidly knowing that I told the truth, but what I had wasn’t much. “What do you do?” He smirked. “I’m a professional traveler,” I sneer.